Since 1955, Florham Park Hardware, a family owned business in the heart of Florham Park, has been a mainstay in the northern NJ community. Owner Allan Epstein, who purchased the business in 1976, carries on the Epstein family hardware legacy, which was founded in West Orange in the early 1900s. Although FP Hardware has grown and evolved over the years, we still maintain our family tradition of caring and commitment of top-notch quality and service to all of our customers. For the past 30+ years FP Hardware has expanded from a neighborhood hardware emporium to a distributor of fine wooden and vinyl storage sheds, children’s playhouses and swing sets, gazebos, and poolhouses. We have proudly named this division of Florham Park Hardware “Al’s Shed World”, as our shed business has taken on a personality of it’s own. 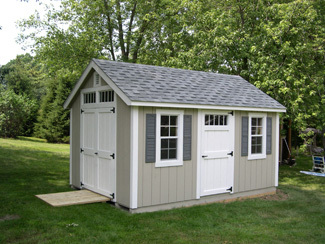 These premium storage sheds are built by the Pennsylvania Amish to our specifications. 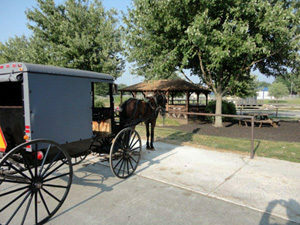 In addition, all sheds and buildings can be customized to meet your personal as well as town’s requirements. At our store, we have four sheds displayed inside as well as several different building styles at a nearby showplace location. There you will see a large variety of styles and colors. If you wish you can call to make a convenient appointment to view our showplace or just come in and visit us. If you are looking for a children’s playhouse think of Al’s Shed World, too. We offer a wide selection of wooden children’s playhouses and accessories, plus we have a large selection of swing sets available for immediate installation. FP Hardware naturally sells a wide variety of hardware and we have just about everything you could imagine for your home including: plumbing, electrical, garden supplies, tools and a full line of Benjamin Moore paints and the popular Weber Grill Collection. With 30+ years of experience in the wooden storage shed business, our knowledge and commitment to personal service is what sets us apart. Stop by and meet Al himself; he will personally show you what your backyard can look like with a beautiful Shed, Gazebo, Playhouse or Swing set from Al’s Shed World.